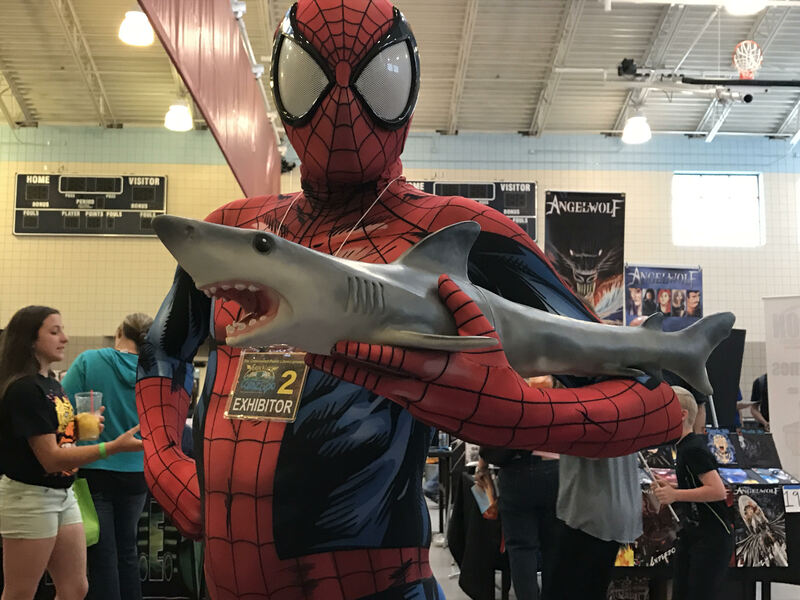 This weekend (April 1st, 2017) I attended the 2nd Annual Verde Valley Comic Expo, put together by the Northern Arizona Cartoonist Association, to spread the word about sharks and the peril they face. Many kids stopped by the booth either to ask questions about sharks, or to watch the dive videos from my recent expedition to Fiji’s Coral Coast, or my past expeditions to Isla Guadalupe in Mexico. Check out these adorable Batkids, who sprung into action to save a shark from a bowl of soup. Kids love sharks, just as much as they love dinosaurs, which may be exactly equal to how much kids love superheroes, and it’s always heartening to see their eyes go wide when they see videos of sharks and the ocean. 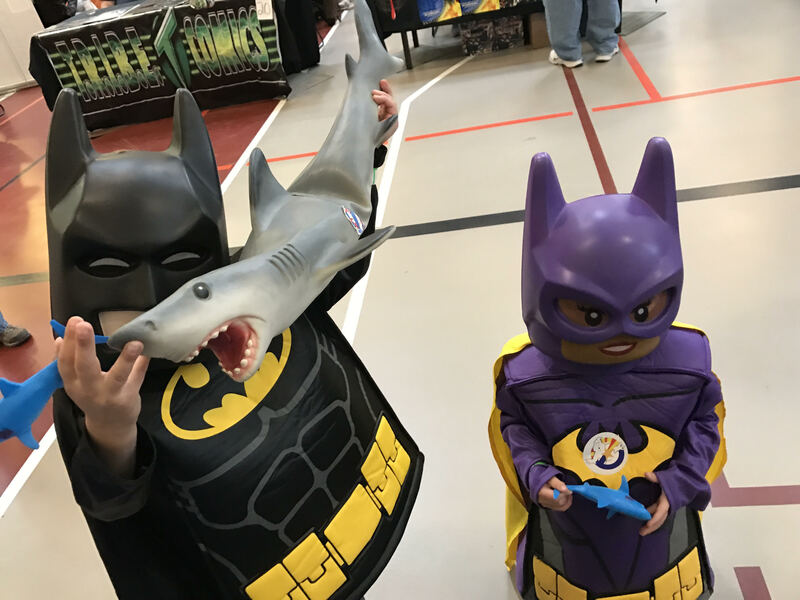 While superheroes may only exist on the pages of comic books and in movies, and the dinosaurs have long since gone extinct, sharks are still here, and they still bring out the kid in all of us. Pikachu does NOT want to catch them all. But it’s also important that adults care about the plight of sharks and their importance in the ocean, so I was thrilled about how many parents stopped by, asked questions, watched the videos, and bought books, sharks, tiki mugs, and shirts – the profits of which go to Fins Attached to support shark conservation. And the parents stepped up when they were asked to sign petitions asking Congressional representatives Paul Gosar and Tom O’Halleran to co-sponsor the Shark Fin Trade Elimination Act (I’ve included handy links to contact them so you can ask them yourself!). It’s a bi-partisan bill that will go a long way to helping keep sharks in the seas where they belong. If you haven’t contacted your Congresscritter about it, now’s the time! 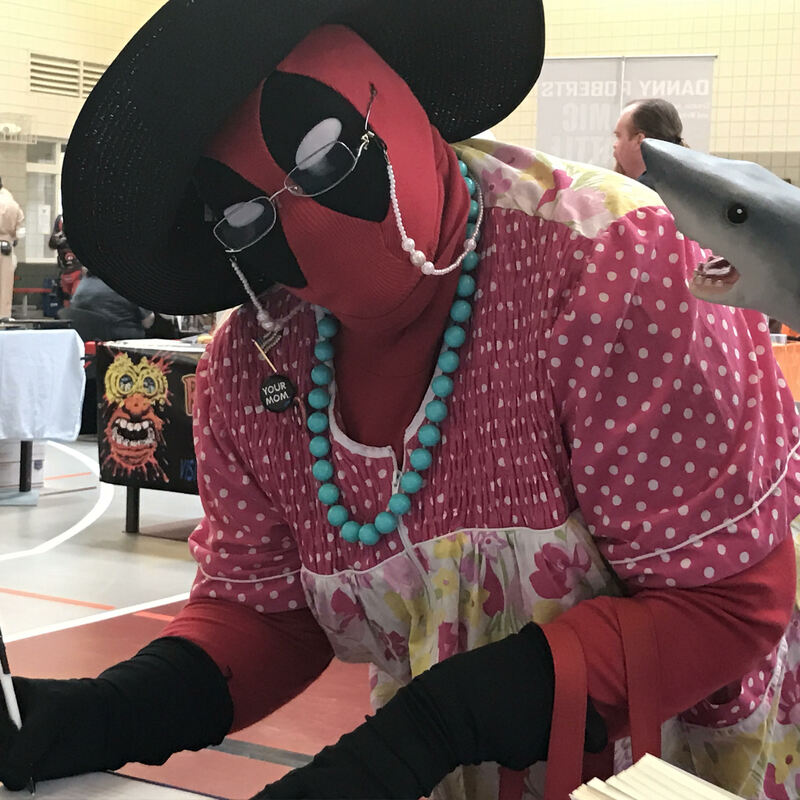 Mompool signed it! And look how happy that shark is. Awwwww. A lot of people were surprised about how I was talking about sharks in the especially land-locked middle of a desert state. As I always say, “shark conservation doesn’t stop at the water’s edge!”. 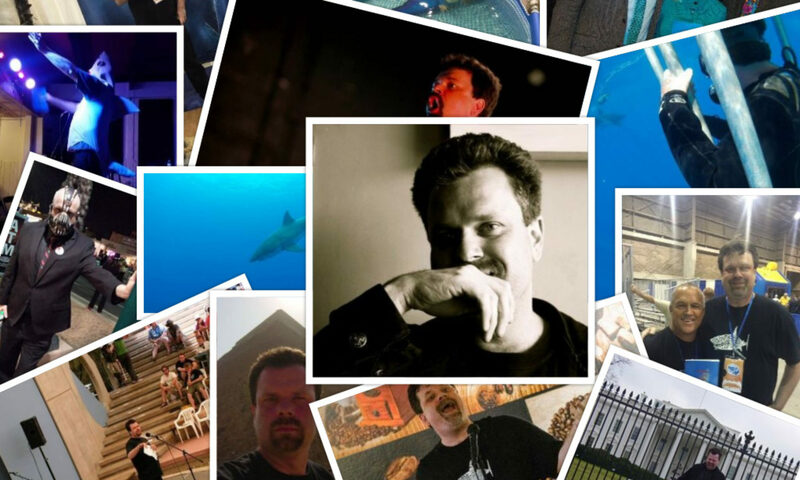 Everyone on the planet has a personal stake in shark’s continued presence on the planet. 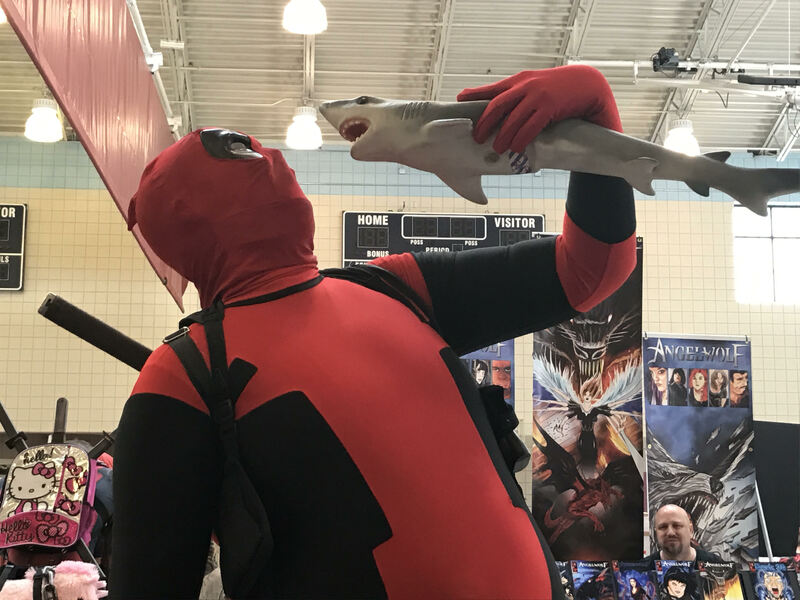 Things would have been different if Spider-Man went to the aquarium that day. 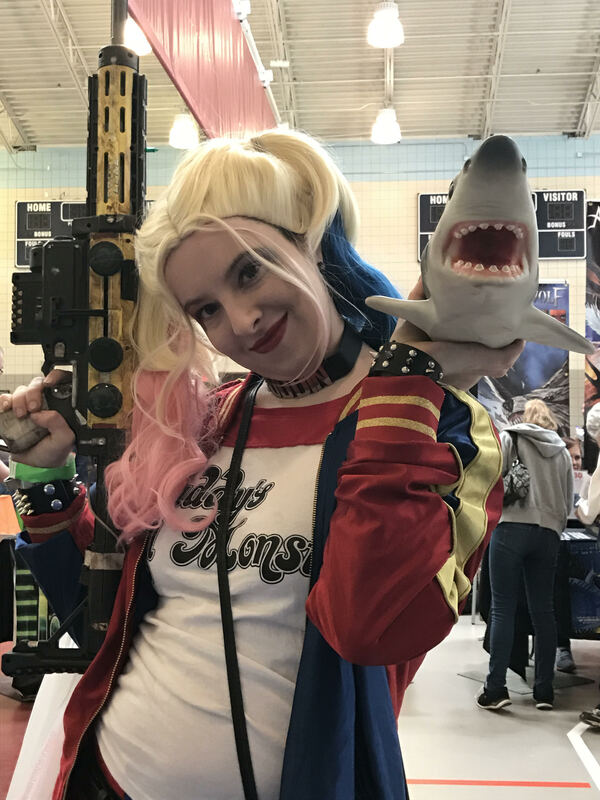 While the Verde Valley Comic Expo may be small in stature, it is big in heart. From what I heard it was bigger than last year, and the staff was super helpful and accommodating (providing power and wi-fi and booth sitters). If you went, I think you got a big taste of what Arizona has to offer in talent. Hopefully even more Arizonans will make the trek to come out and show their work. 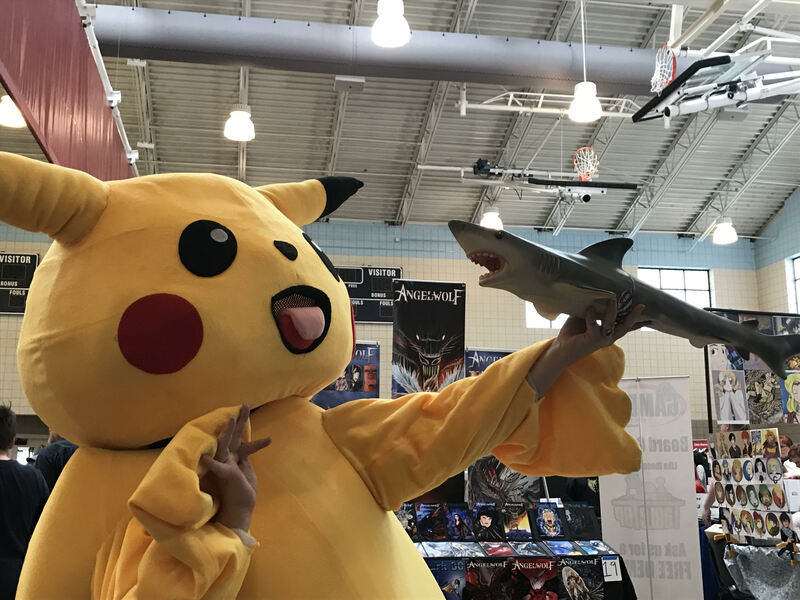 Next year, we’ll have even more surprises at the Shark Booth! Look out, shark finners. This dynamic duo of Harley Quinn and King Shark is coming for you. Also, big ups to the Cheesy Javelina food truck for their delicious pulled pork sandwich that got me through the day (for $8, you get a big delicious sandwich, cole slaw, and a bag of chips – that’s phenomenal). I tried not to eat the whole thing and it was not possible. 5 out 5 shark fins (attached)! Next PostNext Let’s Talk Tuna – Eating Responsibly Without Harming Our Ocean Friends (except the tuna, of course) – Part I.